← Is This Your Boat? 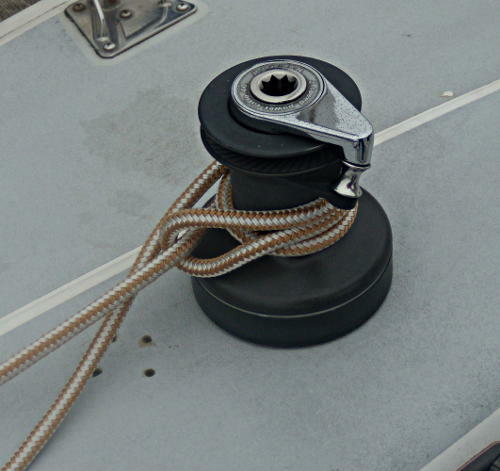 The Towboat Hitch or Capstan Hitch is a good knot when you need a non-jamming tie to a single post, bit, bollard or sailboat winch. 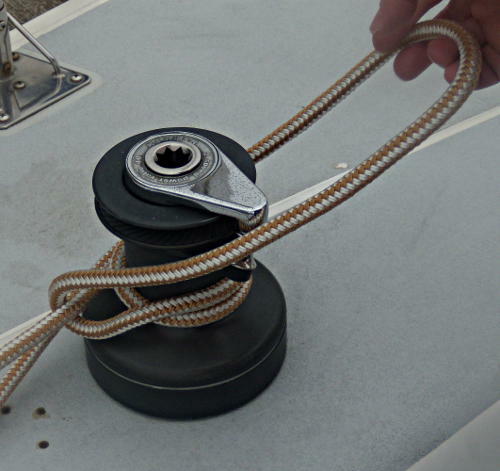 The Towboat Hitch or Capstan Hitch can be tied quickly. It can be untied under load. The Towboat Hitch or Capstan Hitch is very useful but not well known. I use it on a regular basis on my boat to tie lines to the winches when rafting to other boats or tying to the dock for spring lines. The Towboat Hitch / Capstan Hitch is not in Chapman’s and is not well known even to mariners with many years experience on the water. The Towboat Hitch / Capstan Hitch is a good to use if you need to tie your boat to a post or piling. 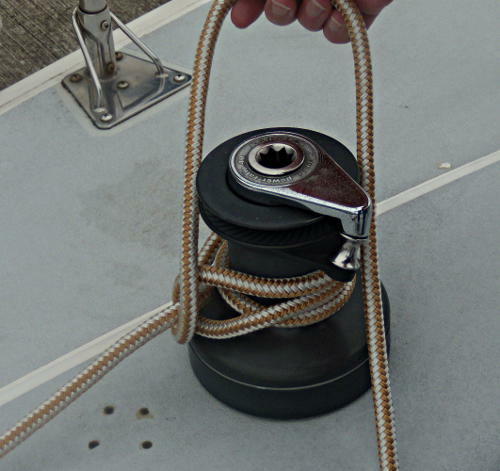 The Towboat Hitch / Capstan Hitch is also known as Lighterman’s Hitch or Backhanded Mooring Hitch. The alternating bights help balance the loads on the line and the winch by alternating the directions of the turns against the line. By balancing rotational loads, the ratchet pawls are not under load and can’t slip. The alternating bights work the same as tying a cleat, the difference here is that there is only one horn to loop around. The line should lead into a winch or other device from 5 to 10 degrees below the winch to help prevent over rides if the line is to be eased or surged under load. Use extra turns on the post or winch for heavy loads. Extra turns on a winch may also be needed if the line is loaded heavy and you are using the winch to add tension to the line. Start with a Round Turn or three around the base. The number of turns around the base is determined in part by the load expected on the line. After taking the turns around the post or winch lead a bight of line under the standing part. Without twisting the line drop the bight over the post and take up the bight snug. Then alternate under and over the standing part of the line and looping over the top of the post or winch. Do not put twists in the line. The byte has been pulled down snug. 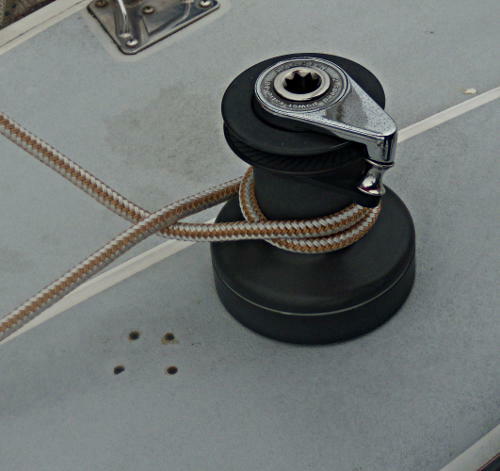 A Towboat Hitch works much like tying a standard cleat except there is only one horn. The same alternating hitches are used after the initial turns around the base. At least 2 loops over the post. 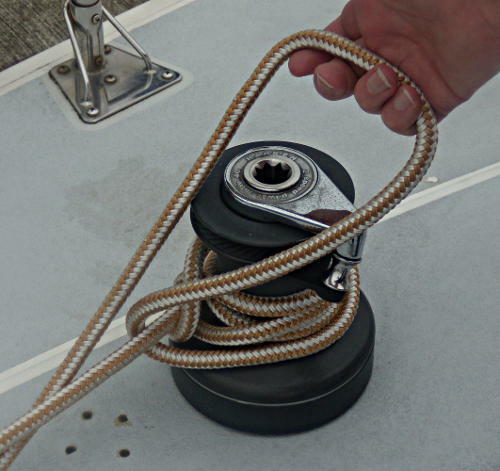 Towboat Hitch / Capstan Hitch – This has been finished with extra loops. Finished Towboat Hitch / Capstan Hitch with a Slippery Half Hitch. CAUTION: If you are easing or surging the line be careful and don’t get your fingers trapped. Depending on the number of wraps and the load you may need to help the line to feed out. Use the flat of you palm to help ease the line, if you do need to take a bight off the post be very careful and use only your finger tips. NEVER get a finger inside any of the loops. Keep the hand holding the free or bitter end of the line well clear of the post to keep your hand from being pulled into the post and bights. 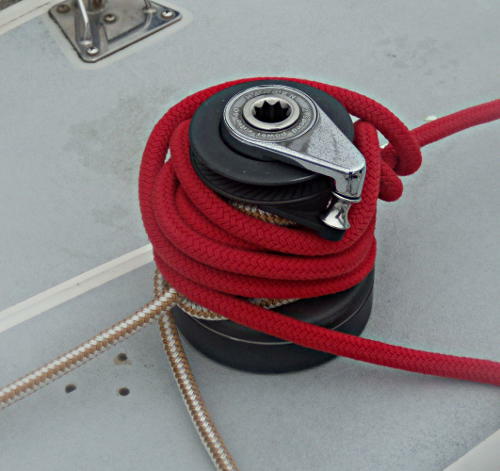 If I am just rafting up for a short time sometimes I will omit the Slippery Half Hitch and just put an extra bight or two over the winch. 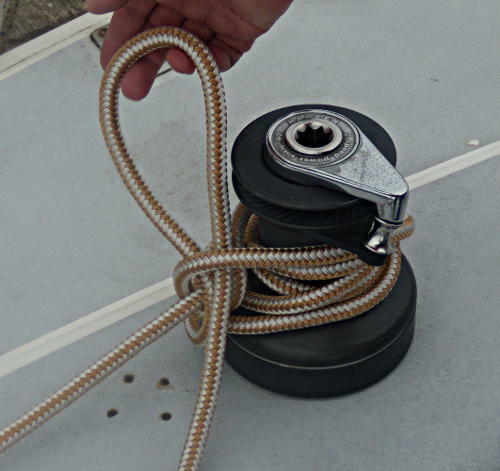 I have also put a second Towboat Hitch or Capstan Hitch over the top of the first Hitch, CAUTION, the double Hitch is messy and I would never use it if I needed to release it under heavy load, my concern is that one Hitch could pull down into the first Hitch and things could become jammed up. Practice this one a bit and amaze your friends! 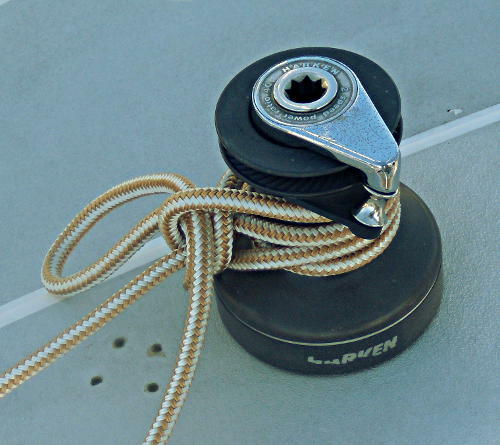 A Round Turn and Two Half Hitches can also be used to tie to a single post, or to tie a fender to a stanchion. How to tie a cleat (Is This Your Cleat?) – Instructions with pictures on tying a cleat . Thanks for supporting boating safety! 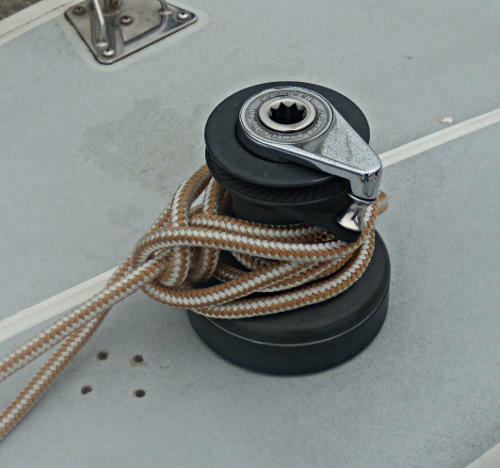 This entry was posted in Sailing and Boating Skills and tagged boating knots, boating safety, boating skills, capstan hitch, knots, marlinespike seamanship, towboat hitch. Bookmark the permalink.